Gold bounced back above $1,200 an ounce and from its lowest settlement price in more than three years, but prices still finished sharply lower on the week and the metal is headed for its first annual decline since 2000. Gold for February delivery added $10.10, or 0.8%, to settle Friday at $1,203.70 an ounce on the Comex division of the New York Mercantile Exchange. For the week, the precious metal slid $30.90, or 2.5%, with the Fed tapering decision pressuring prices and turning investors toward stocks. "Money always goes where it’s well treated," Quincy Krosby, a market strategist for Newark, New Jersey-based Prudential Financial Inc., which oversees more than $1 trillion, said in an interview relayed on Bloomberg News. "If you were doing well in equities, you didn’t need to be in gold. As long as the economic data continues to gain traction, we should see the dollar rise and the Fed continue to taper. That’s typically negative for gold." Gold started to fall in after-hours trade Wednesday after the Federal Reserve announced that it was trimming its monthly bond purchases to $75 billion from $85 billion. The decline continued into Thursday with prices falling $41.40, or 3.4%, to close at a level not seen since the summer of 2010. 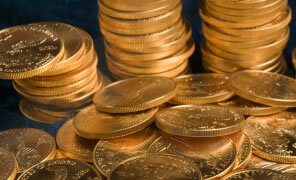 Gold is poised for further losses next week, based on the majority of participants in Kitco’s weekly gold survey. "In the Kitco News Gold Survey, out of 34 participants, 23 responded this week. Of these, eight see prices up, while 11 see prices down and four see prices sideways or are neutral," reports Kitco. "Participants who see prices sliding further next week said the downward trend should continue to assert itself… Participants who see higher prices said they believe that year-end book-squaring will dominant market action next week. Since speculators are heavily short gold, there might be some of these traders who buy back these previously sold positions and that could lead to a temporary boost in prices." For the year-to-date, gold has plunged 28.2% from its final 2012 close of $1,675.80 an ounce. Reuters notes that the yellow metal is on track for its biggest annual decline in 32 years. Silver led percentage gains among precious metals on Friday, and it dropped the least on the week as a result. Silver for March delivery advanced 26.4 cents, or 1.4%, to close at $19.45 an ounce. Prices fell 0.8% on the week. Snapping a seven-session losing streak, January platinum tacked on $13.80, or 1.1%, to $1,332.20 an ounce. Platinum prices for the week declined 2.3%. Higher for the first time in four sessions, palladium for March delivery rose $2.45, or 0.4%, to $698.75 an ounce. Palladium ended 2.4% lower than a week ago. The following grid shows the net percentage changes in New York precious metals futures through Dec. 20, the completed quarters in 2013 and the year-to-date. London precious metals declined on the week with losses totaling 3% for gold, 1.1% for silver, 2.9% for platinum and 3.2% for palladium. The following grid shows the net percentage changes in London precious metals fixings through Dec. 20, the completed quarters in 2013 and the year-to-date. Weekly sales of United States Mint bullion products were limited to gold coins following the sellouts last week of 2013 American Silver Eagles and 2013 America the Beautiful Five Ounce Silver Bullion Coins. Buyers will have to wait for 2014 offerings. 2014 American Silver Eagles do not launch until Jan. 13 and the first 2014 ATB silver bullion coin is not expected out until Jan. 27. 1,500 ounces in 24-karat American Gold Buffalo coins, versus 4,000 previously. Listed below are U.S. Mint bullion sales for the week, for the month through Dec. 20, and the year-to-date. *Perry’s Victory and Great Basin silver bullion coins sold out on Tuesday, Dec. 10. The U.S. Mint will not have America the Beautiful Five Ounce Silver Bullion Coins to sell until the first 2014-dated strike is released in late January. The final allocation of 2013-dated American Silver Eagles sold out last week.